A dozen-plus pastors from influential African-American churches endorsed councilman Andre Sayegh in the six men mayoral race. 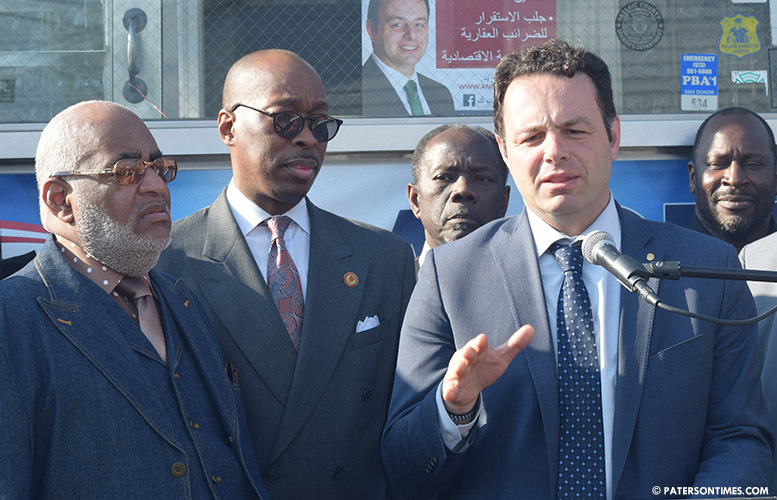 Sayegh received the support of 18 pastors at a brief event outside the former Eggplatter Diner on Crooks Avenue on Saturday afternoon. “Our city needs a mayor who has the unwavering commitment to lead Paterson forward,” said pastor Kenneth Clayton of the St. Luke Baptist Church. He said while Jersey City and Newark are attracting new businesses and creating opportunities for their residents, Paterson continues to lag behind. Clayton cited Sayegh’s work in the 6th Ward. He said the councilman has championed successful efforts to make his area safer and economically robust. Sayegh is hoping the endorsements of the 18 pastors turns into support at the polling places on May 8. “He’s come to us, come among us. He showed us he wants to befriend us. And has a genuine concern for our needs. Some of the candidates haven’t taken the time to do that,” said pastor Norman Harris of the Greater Bethel Church of Christ. Some of the pastors said Sayegh is extremely responsive to their concerns. Six men are running for mayor. Two of those candidates are black – Michael Jackson and William McKoy. Other candidates are Alex Cruz, Alex Mendez, and Pedro Rodriguez. Clayton rebuked McKoy earlier in the month for making a controversial statement about civil rights leader Martin Luther King, Jr. At the time, McKoy’s supporters said the comment was blown out of proportion by Sayegh supporters. “Two separate events,” said Clayton. He said his support today had nothing to do with his condemnation earlier in the month. Sayegh at public forums said he will hire a skilled business administration. At those forums, he said he will be a cheerleader for the city. McKoy has criticized him stating he is trying to outsource the responsibility of the mayor. “That’s not a mayor for the city of Paterson,” said McKoy on Saturday afternoon. McKoy said people respect their pastors, but on election day each voter will walk into the booth and make their own decisions. Sayegh supporters see the endorsement as significant. Some see it as the African-American community rallying behind their candidate. “Our home is in need of improvement. We’re here to breathe new life into a city that has been gasping for air for far too long,” said Sayegh. I agree with you worshiping an imaginary sky daddy is ridiculous. Perhaps these 18 pastors are starting to wake up from their deep sleep. The identity politics that has plagued the inner cities for decades need to stop if they want to see a progressive change that will shape the community for the better. Race should not be a factor when determining the best candidate. Look at the past 30 years in cities like this and tell me what has helped. There needs to be a change. Our pastors who worship on Sunday and not on Saturday do not know that they need to vote for our Mayor the Black Savior Jesus the Christ and not their fake idol. If we have a mayor who can lead us based on the laws of God and not the laws of men we will have heaven in Paterson. The United States has separation of church and state for a reason, and I think this has worked out pretty well. I have no interest in a government run by religious laws because one man interpretation of religious laws will not be the same as the next man. What about all the Middle Eastern citizens that live in Paterson, should they be governed by someone's interpretation of Christian laws? McKoy said people respects their pastors and they do, he should know that, all the Jamaican at his church will probably vote for him. But they should wonder will he be effective. Can he effectively lead. This is truly a beautiful city rich in history. Look at jersey city major fulop is doing a great job, major corp have come into Jc , let do the same here. Let work hard for our school district.